A New Dawn Realty continues to serve homeowners in Stokesdale with the best in real estate services, helping homeowners find the perfect buyers for their homes in Stokesdale. Whether you’re new to Stokesdale or have been living here for years, A New Dawn Realty wants to be your real estate agency of choice, helping you with all of your Stokesdale real estate needs. To learn more about our Stokesdale real estate services, contact us today. 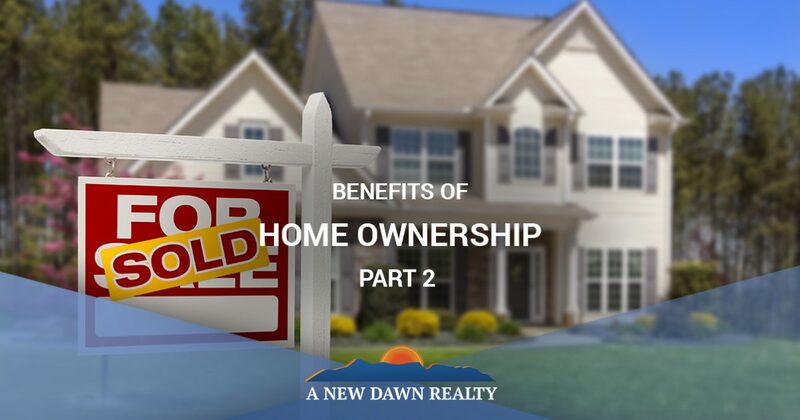 In part one of our blog series, we talked about a few of the benefits of owning your own home. From having more individual control over your home to the investment side of homeownership, the benefits of owning a home are numerous. Concluding in part two of our blog series, here are just a few more examples of benefits that come along with homeownership. In doing more renovations and repairs in your home, you will inevitably become more skilled overall. While renting a property sometimes allows you the convenience of an on- or off-site maintenance person that handles any work that needs to be done in your apartment or home, when you buy a home, you learn quite a bit about various repairs that need to be done around the house. While some jobs are a bit more involved than others, by owning a home, you will become more knowledgeable about everything from plumbing to wiring and an array of other fixes. Another benefit of home ownership comes from the community aspect of it. While moving into a rented apartment or home guarantees that you’ll live there for a least a year, this also applies to your neighbors. Because of this, even if you continue to live in your rented property for more than a year, there’s a good chance that others in your neighborhood may choose to leave after a shorter amount of time. When you buy a home, you are committed to it, and the same goes for the other people in your neighborhood. Because of this, you will not only be able to develop lasting friendships with your neighbors, but you’ll also feel a sense of community amongst these people who share the neighborhood with you. Those are just two more benefits of ways that home ownership can be beneficial to you. If you’re looking to purchase or sell a home in beautiful Stokesdale, A New Dawn Realty is here to serve your real estate needs. We want nothing more than for our clients to be happy and satisfied with our services, and we work hard to ensure this. To learn more about our Stokesdale Real Estate agency, contact A New Dawn Realty today.